Technique of the Week: Grilling | We Like to Cook! A well-made fire is the essential first step in the technique of grilling. The right fire makes barbecuing smooth and simple. The temperature of the fire needed depends on the type of meat you are going to cook. For cuts of meat such as steaks, burgers, and kabobs which you intend to cook rapidly, use a relatively hot fire. A moderate fire is fine for roasts and larger pieces of meat. For slower cooking cuts of meat such as pork chops and spareribs, use a slow fire. Charcoal comes in two forms: lump charcoal and briquets. Lump charcoal is in odd-sized pieces just as they come from the charcoal kiln. It is less uniform in burning quality and more difficult to handle. Briquets are ground, lump charcoal pressed into uniform blocks. They are easier to use, burn evenly, and produce a more uniform heat. They are easier to control and burn longer than lump charcoal. Pile the charcoal in a pyramid on the firebox of the grill. You don't need much charcoal. Beginner chefs are often too ambitious, build too big a fire. After you've built several barbecue fires, you'll be able to gauge the amount easily. Add liquid lighter to charcoal; wait a minute, then light. Do not use gasoline or kerosene. Let charcoal burn for 15 to 20 minutes until the briquets are about two-thirds covered with gray-ash. Spread the briquets evenly throughout the grill. The bed of coals should be shallow (easy to control) and just a little larger than the area of food you are cooking. Place a wad of newspaper in the base of the chimney, add 6 to 8 charcoal briquets, and then light the paper from the bottom of the chimney. When the briquets are burning, add more to the top. Allow to burn about 15 minutes, and then lift off chimney (with tongs!) and rake coals where you want them. Don't start to cook until the fire dies down to glowing coals. Coals are ready for cooking when they look ash-gray by day, and have a red glow after dark. No flames! Don't start cooking too soon. When coals are hot, tap off the gray ash with fire tongs; ashes on the briquets insulate and retard the heat. An easy way to tell the heat of the fire is to hold your hand over the coals at the height the food will be for cooking. Begin counting "one thousand one, one thousand two", and so on. The number of seconds you can comfortably hold your hand over the fire will tell you how hot the fire is. If you can count to "one thousand two," you have a relatively hot fire; "one thousand three" or "one thousand four" is about a moderate fire, and "one thousand five" or "one thousand six" is a slow fire. If you are cooking a large piece of meat that requires a long cooking time, plan to replenish the coals from time to time. Add a little extra charcoal around the edges after your fire is ready for cooking. Don't top your cooking fire with cold coals; this will lower the temperature more than you think. To increase heat, add warm coals from the reserve around the fire's edge. To slow down the fire, move hot coals out to make a larger oval; to increase heat, move hot coals in to make narrower oval. This technique helps maintain the even cooking. Fire is ready only when flames die down. In broad daylight, the coals will look ash-gray and after dark, they'll have a red glow (they burn from outside in). If drippings do flare up during cooking, sprinkle the fire lightly with water to quench the blaze. Keep handy a clothes sprinkler filled with water close by. Use only enough water to do the trick; don't soak the coals. It will take some time for very wet coals to dry out and begin to burn again. It will also reduce the intensity of the heat of the fire. Orders for "rare" go on the grill last. When you see little bubbles on top surface of the steaks, they are ready to turn (heat forces the juices to the uncooked surface). 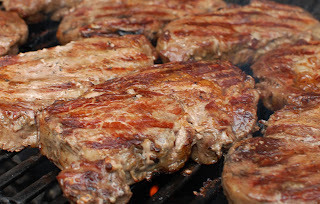 Flip steaks with tongs and a spatula; piercing with a fork wastes good meat juices. Cook the second side a few minutes less than the first since the second side has a head start on heating. Turn only once. For 1-inch steaks cooked medium-rare, allow 13 to 15 minutes total grilling time. It is always a good idea to use a meat thermometer when grilling. Insert thermometer so tip is in center of meat. Tip must not touch bone, fat, or the metal spit. For charred crusty coat, try this: Sear one side by lowering grill top close to coals for 2 to 3 minutes, then raise grill to finish same side. Turn steak, and sear second side; again raise the grill and complete the cooking. Wait until you turn the meat to salt it. Salt and pepper the browned side and then season the other side as you take it off the grill. If you salt uncooked meat, the juices will be drawn out and you'll lose good flavor. It is also important to let any grilled meat rest for at least 5 minutes before serving to allow the juices to retreat, otherwise all the flavor drains out of the meat when it is cut.